I took a deep breath. "Okay. Okay. But... Seth." I stared into my hot chocolate, as if it would rise out of my cup and announce the answer to all my problems. Jo sighed. "I know. Can I tell Paul to help? Will it hurt him to help? How do I convince Seth, especially after... you know..."
I took another deep breath, fighting against tears. You can do this, I told myself fiercely. "I... I can deal with Seth. We'll both be heart-broken for a bit, but... I have to let him let me do this. And it has to be me," I said. I finally looked up from my drink to look at Johanna. "I'm gonna need your support again, after I talk to him. Please? Please help me," I added, wondering if begging would help my cause. Sooo.. I'll try and be back tomorrow, but i'll definitely be back ASAP! Oh and where's Quil?? Does anyone know... i'm guessing still with Emmie's character?? Emmie~ Who doesn't love Damon? But I like him much better in the show. Fat~ you are really here! I'm proud of you, hun. thankis, I had alot of fun. I'm really sorry, guys! I know that it takes everyones co-operation to keep the team alive,but...but...I was forced to move back to Thailand and now I am also forced to go to a normal Thai school. Problem: Thailand and U.S. have different material standards. What do I have to do? Study an entire years worth of material, get tested on said material, get certified with pre-requisites, then go into the middle of the year. So expect me gone for a while, I'm sorry!!! I'll try to liven it up here a bit! I'm here with some wonderful news! 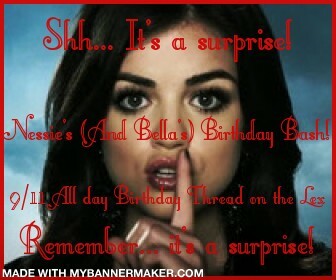 The mods will let us have a birthday party for Nessie (and Bella) on the 11th! We are throwing the party for Nessie, but it is also a surprise party for Bella. Isn’t it terrific? Alice: Hey girl! Awesome! Will check it out!!!! Hanny: I know!! Where is everyyyyyyyyyyybody?! Dex: Okay! I see what i come up with! hmmm....... i don't know what to RP? No ones Rped in a while!!!!!!!!!! COME BACKKKKKKKKKKKKKKKK TEAM QUIL!! Right. So I checked the do's and don'ts to double posting and this is allowed. Sooo..
Everone's let the team down!! humph!!!!!!!!!! So I'm going to TRY and RP... .
Tyler and Sunny- on the beach too. Introducing selves to Cassie. I gently took her hand and gave it a shake, while introducing myself as well. "I'm Cassie. Nice to meet you, Sunny and Tyler." "Likewise. Say, were you just about to go to the beach?" Sunny asked me. "Yeah, I was out on a walk." I replied. "I was looking for something to do." "Well, there's this campfire on the beach tonight. You wanna join us?" Sunny asked me enthusiastically. "And all the kids on the rez will be there. It's going to be wicked fun!" Tyler added. I hesitated and I thought about it. I hadn't really been to many social things since i first came to La Push. And Tyler had made it sound like lots of fun. "Okay" I said. "Sounds like fun"
"It will be. And you can meet Quil Atera" Sunny smiled. A smile started to form on my face too, as i wondered who this Quil person was. So maybe a campfire can open it up for EVERYONE to come back and join in!!! And Me and Quil can imprint too. COME BACK! COME BACK! COME BACK! COME BACK! COME BACK! COME BACK! COME BACK! COME BACK! COME BACK! I'll be back in the afternoon in Thailand. (REAL early in the morning in the U.S.) I have homework *cough*that's not even mine*cough* to finish by the morning so I'm probably gonna pull an all nighter then give my brother's hoework to him before he goes to school. I'll regain some sleep after heleaves and I'll wake up in the afternoon to RP. I promise! I have to reply an e-mail anyway.